4K.Symbol of poverty.Man with cardboard considers some cents charity. 4k00:154k, Homeless man sitting on a sidewalk with his dog. hd00:13CHURCHILL, MANITOBA, CANADA - CIRCA 2014 - People walk along a snowy road at Churchill, Manitoba, Canada, Hudson Bay. 4k00:14Passer giving alms for homeless man. Sign on cardboard - will work for food. 4k00:164K. 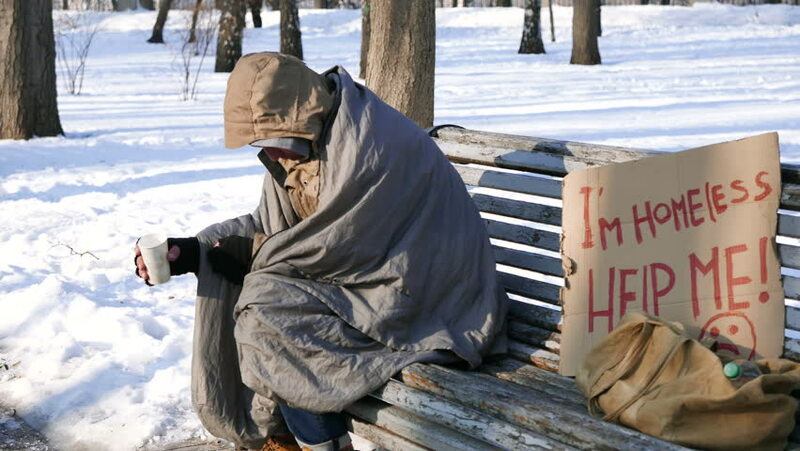 Homeless man sleeping on bench in winter park.